One week after the beginning of the riots in Sidi Bouzid , following the immolation by fire of a young man, the assessment of the situation is more than necessary. Riots are continuing in Sidi Bouzid and they even disseminated to other parts of the area including: Meknassy, Menzel Bouzeyen, and Mezzouna. On Wednesday 22nd, another young man Houcine Neji committed suicide by electrocution. His mother died few hours later. Despite the propagation of the clashes in the area, authorities and official media declared that the clashes were an ‘isolated incident’ and they even denounced its exploitation for unsound political purposes by the opposition. Today, another young man died. However this death is different from the two others as, Mohamed Ameri, a mathematics teacher, did not try to commit suicide. Indeed, he was shot by the police during a demonstration. We talk about a dozen persons wounded. Another teacher, Issam Ghaberi, was violently assaulted by police and thrown in a critical situation outside his town. The situation is getting worse especially that the government is not trying to find a long- term and sound solution to the situation. The authorities announced new development projects but these measures did not satisfy Sidi Bouzid inhabitants as the violent clashes erupted again between police and demonstrators (Menzel Bouzayane). Moreover, using an oppressive policy aggravated the situation: denying the reality of facts, cutting electricity and internet connection, using force and multiplying the number of policemen in the region were all facts that sparked public anger. 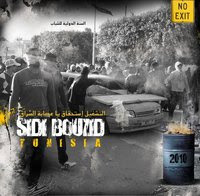 Support actions were launched inside and outside Tunisia. Calls for other support actions are flourishing on internet. Rumors say that the authorities are sending military forces as reinforcement for the police forces besieging the area. Journalistes et Droits des Femmes.